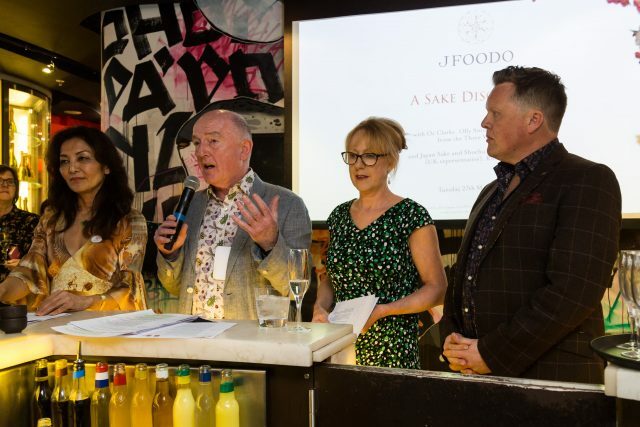 Jfoodo, the Three Wine Men – Olly Smith, Oz Clarke and Susy Atkins standing in for Tim Atkin with Japanese food and culture promoter Rie Yositake hold an event at Sushisamba. The Three Wine Men joined forced with the Japan Food Product Overseas Promotion Centre (JFOODO) on Tuesday night to formally introduce London to sake. The evening, which began with sparkling sake aperitifs in Sushisamba, was a mission to persuade wine enthusiasts and food lovers of the versatility of sake by pairing it with non-Japanese food, from fish and chips, to oysters to charcuterie and cheese. Wine experts Oz Clarke, Olly Smith and Susy Atkins, and sake enthusiast Rie Yoshitake were on-hand to help with the tasting notes.